On Sunday, we headed out to Palm Springs in a rather mellow mood. Early Sunday morning had been real nice for personal reasons. Anyway, about the hotel: Palm Springs has many of these little mom and pop resorts, different motifs, but basically about ten rooms surrounding a pool in a courtyard. This was the way of things in the ’40s and ’50s before the advent of the mega-resorts. 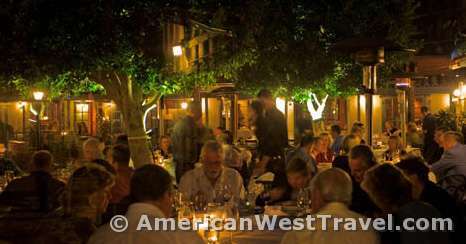 They have made a comeback in the modern era, having been refurbished into bed and breakfast style places, a prefect place to enjoy one’s Palm Springs wedding. The emphasis is on service and your relationship with the innkeeper. If you check TripAdvisor, the top of the list is dominated by these places. We arrived at our place, Desert Riviera, number one on TripAdvisor. The innkeeper, Judy, was a dynamo. Right in the door, do we want beer, a glass of wine, pop? Then the shocker. They’d been refurbishing their plumbing, and there was some kind of failure, leaving half the rooms without water. She’s mortified by all this. So first, she’s telling us about her friends down the street at La Maison Hotel, number three on the list (after Judy’s two hotels). Almost identical setup, just a different motif (South of France vs. Judy’s ’50s art-deco). Second, she wants to pay for dinner. We wound down from the 5-hour drive relaxing around the pool. However soon it was “happy hour”, and we were being offered free beer and wine. After the last three days, we were feeling pretty jolly in no time. Our plan was to eat light tonight and have the celebratory meal tomorrow after the ceremony. So the next stop was back to Judy to work this out. Being Palm Springs which is exceedingly LBGT-friendly, I decided to just be open about everything, or maybe just without inhibitions, given all the partying. Anyway, I told her we were getting married the next day and wanted a celebratory place for dinner after that. She got all cranked up and excited about this. We ended up with a $100 gift certificate at one of the best restaurants in town, plus a promise of a free night ($150-200) at her hotel the next time we come to town. After that, we went to the famous Smoking Burger, featuring burgers made out of prime chuck. Any other time, that would have been our feature meal. Despite other distractions, we had time for a run early Monday morning and then a little continental breakfast at poolside. Just beautiful. We had to be at the Riverside County office in Indio (25 miles away) at 9am to do all the paperwork ahead of the 10am ceremony. At the county office, it was eye-opening time. For the very first time, we encountered real people like us. Most poignantly, these two women came in with their families in tow, young kids, siblings, a mother. They had come in from Arizona, like us. It touched me, how especially affecting an issue this is when there are children and families involved, and these two women just wanting to be a real family. And then there was the ordinariness of it all: ordinary people living ordinary lives doing something completely ordinary like getting married and trying to be happy. Where does anyone get off denying people just like them…just like us? I didn’t used to think about this issue much, it never much affected my life, but now the naysayers and bigots appall and disgust me. The mother was sitting next to me, and I commended all the family support to her daughter and soon to be daughter-in-law, and mentioned how we were tying the knot after 40 years of being together and didn’t have anyone there for us. She immediately starts telling everyone what I said. They go all excited and boisterous, taking our photo and saying they’ll be our family for today. It was very, very cool. Soon the paperwork was done, and the clerk was directing us to the “chapel”. A few minutes later she arrived in her robe, now as the Deputy Commissioner of Marriage, and she performed a real marriage ceremony just like anyone else. I sort of lost control of my emotions at the point when I had to face Gerry and repeat the vows. And it was the first time we’ve ever shown physical affection to one another in front of another person. Lots of firsts. I’d mentioned to the lady about the 40 years. She said the longest she’d heard of was 47 years. Gerry had read about them in the local paper. They were married by the mayor of Palm Springs. We drove back to the hotel to change clothes. I told Richard, the innkeeper, that we were just coming back from a wedding…ours! He got all excited, said it was a special event for his hotel. He immediately fetched his wife to tell her about it. When we got back later in the day, she gave us a bottle of Prosecco which we consumed at poolside (the never ending party!). However first we went for brunch at Cheeky’s, the city’s top breakfast and brunch place, and the hippest place in downtown. This was definitely a “we’re not in Scottsdale anymore” experience. All different kinds of people, clearly about half gay and half straight, and various nationalities. Among the provocative artwork on the walls was a drawing of two men, bare from the waist up, one standing behind the other, in contact, with his hands over his friend’s eyes, a “guess who” moment. And then there was the food. I had an heirloom tomato sandwich that included the tomatoes, fried eggs, apple-smoked bacon, and arugula on rye bread with a delicious sauce. 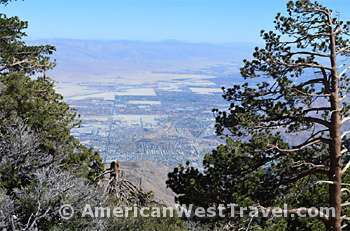 From there, we went on the famous Palm Springs Tramway. 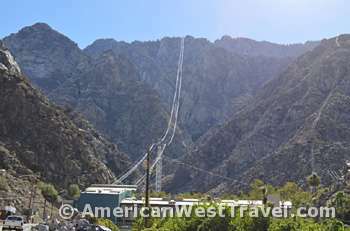 It goes to the crest of the San Jacinto mountain range. The upper station is at 8,500 feet. 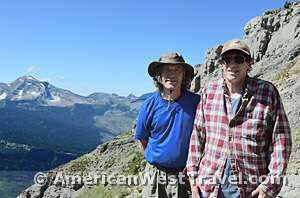 The city is at elevation 500 feet, and the lower station is at the end of a steep road just outside of town at 2,900 feet. It gains 5,600 feet in two miles – the last part, you’re going almost straight up! (Going down was seriously freaky!) At the top the temperature is nearly 40 degrees cooler, and you are in the woods. There is a network of trails which people use for hiking in the summer and cross country skiing in the winter. We hiked for an hour or so, and then back to the hotel for some champagne drinking. The couple sitting next to us was from San Luis Obispo County (one of my favorite places) so I happily babbled on with the wife about the wonders of SLO. Luckily, we reserved a late dinner so we had some time to recover from the drinking. The place is called Copley’s, located in Cary Grant’s old estate (Photo, above). It cooled off at night so we were able to sit outside in the gorgeous courtyard. Good people watching, too. It was mostly people on dates (you can tell when they sit next to each other, rather than across), again a very mixed crowd. And it was just so normal. Judy had also discussed us with the maître-de, so he and the waiters were congratulating us and being real nice. It’s just so cool being completely open about yourself and everyone being so nice to you. This is the first time we’ve ever experienced this. And then there was the food (again). Gerry had a rack of lamb, and I had a “sashimi grade” ahi tuna sliced steak. This was probably the greatest piece of fish I ever tasted. I ended up giving Gerry almost half of it. His lamb was excellent, too, but this fish was amazing. We even had a fabulous desert, too. Luckily, we knew not to drink any more. Too bad though. We had brought along a beautiful 2004 Pinot Noir we’d been saving for years. Don’t worry though, we took care of it when we got home – we made dinner for my parents last night. Sadly, we had to head out on Tuesday morning. Cornelia gave each of us a good hug, told us how happy she was for us and how glad we ended up staying at her place. And that was our adventure. I guess it’s an obvious assumption that newlyweds have lots of good and exciting intimacies surrounding their big day and all the excitement. Well, I’m here to tell you that it’s absolutely true, even if you’re 60! It’s pretty amazing. You’re never too old to learn great life lessons, or to experience great things.